Fall is just around the corner; the leaves are starting to turn color and gently fall, and the rhythmic singing of crickets fills the air. The days are getting shorter, throwing early long shadows across the waters of the Adirondack Park, helping to cool the rivers, ponds, and lakes. 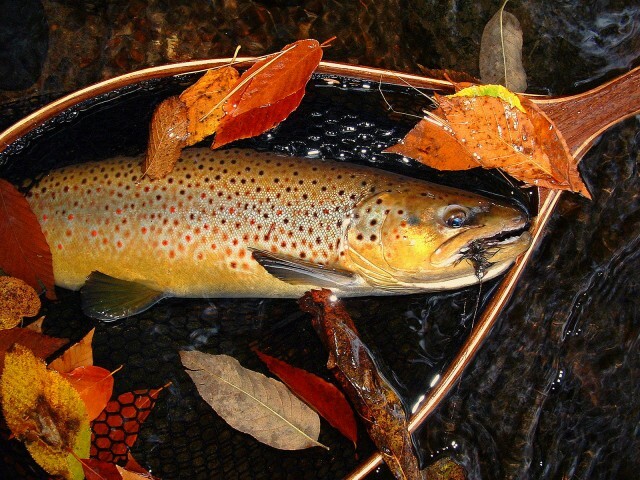 The months of September and October showcase fantastic days for fly fishing with the waters cooling off to temperatures (50F – 60F degrees) that are most productive for feeding trout and other cool water species. The fish need to fatten up this time of year to prepare for spawning season in the late fall. You will start to notice the female trout getting plumper as they are maturing with eggs, but their coloring will not change very much. The brown trout males are developing a more pronounced hook jaw, known as a kype and they will turn a darker charcoal color. The brook trout will be displaying their more prominent spawning coloration, with brighter orange bellies on the males and their red and white fins will almost glow. 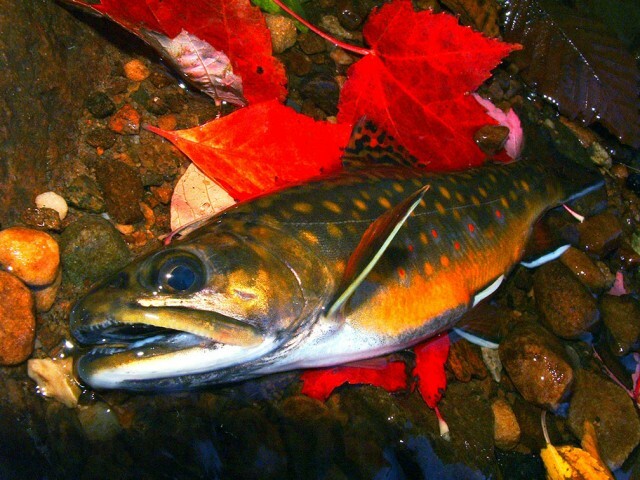 The fall is a great time for small stream fishing as the brook trout and brown trout will be entering the small tributaries to spawn. The trout will just be starting the staging process, not actually spawning, by the time trout season ends October 15th, so if you release the fish without causing it too much stress it will have no problems spawning later in the season. Another species that will be starting its journey upstream is the landlocked Atlantic salmon. These fish will migrate out of Lake Champlain upstream into the rivers and streams of the foothills of the Adirondacks until they can go no further due to impassable barriers. Some river dams do have fish ladders so that the salmon can get up to their spawning locations above the dam; one example of this is on the Bouquet River in Willsboro. While there is no fishing allowed above the dam, it is quite amazing to watch the fish make their way up the ladder and around the dam. Check Lake Champlain tributary regulations if you intend to fish for this species. Early to mid-September will see some amazing insect activity. The isonychia mayflies (also known as the slate drake) and the stoneflies will be in great abundance. Both of these flies can be presented as either a dry fly or a nymph pattern. The dry fly will work best during the early morning and again in the evening. The nymph can be presented at almost any time during the course of the day. On an overcast day, you will be able to experience the actual hatching of the isonychia, which will generally take place in the middle of the day. The hatch itself is quite unique as it is the only species of mayfly that will swim and then crawl out of the water to hatch on a rock or log. It is quite a sight to see. The isonychia nymph will dart around in the water as it swims to the rocks, when fishing with the nymph pattern, be sure to impart action in a swimming and twitching manner. As the season moves along and the temperatures get cooler, nymphs and streamers will work best. The top water insect life slows down as the air and water temperatures change causing the fish to feed further below the surface. For nymph fishing I suggest a 3x tippet with a 7.5’ – 9’ leader, depending on the type of water being fished. A double nymph rig, or tandem, with an Ausable Ugly as point fly (first fly) and Hares Ear, Pheasant Tail or Copper John as dropper (second fly) set up with the dropper attached to the bend of the point fly hook. The dropper can be attached from the tag end of a blood knot. There should be 18 – 24 inches of the 3x tippet between the point and dropper. Make sure to check local regulations on multiple fly presentations before going out on the river. In streamer fishing a 2x tippet is recommend with a 7.5’ leader. Productive patterns include: the Sirloin, Wooly Bugger, Muddler Minnow, and many more. Check in with some local fly shops to see what flies are most likely to be successful during the time you will be fishing. A great way to present these flies is to quarter cast (a quarter of the way across the stream or river) downstream with a strip – stop – strip retrieve action performed at various speeds. The cooler the water, the slower you will want to strip your line. 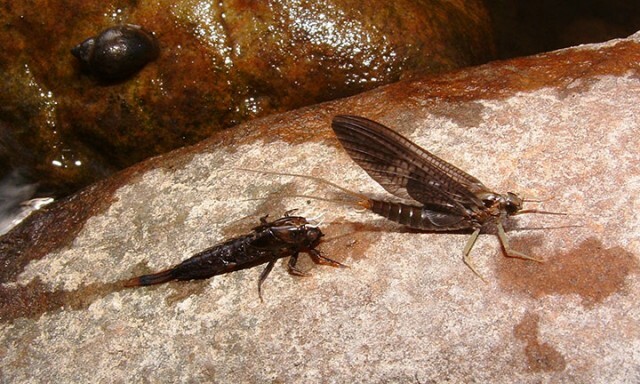 The blue winged-olive mayfly is a great dry fly choice in late September and early October. I would recommend a size #18 – 20 with a 6x tippet and a 9’ leader. It is one of the few hatches late in the season and one that a dry fly fisherman will not want to miss. There are many other reasons besides the feeding patterns of the fish as they prepare to spawn that make the fall a great time to fish in the Adirondacks. 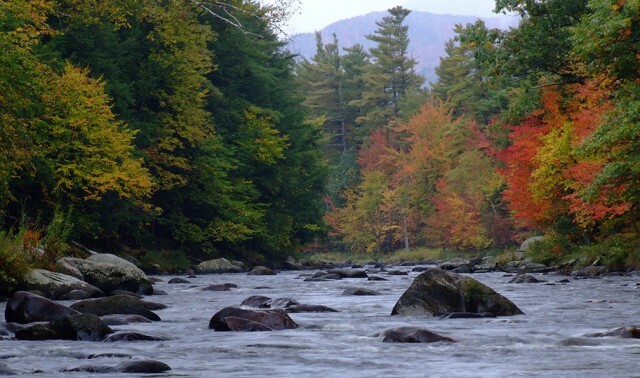 The fall foliage is breathtakingly beautiful, and the waters are not crowded, and with less pressure on the fish they are more likely to strike. Also, you do not need to be on the water at sunrise, as the water temperatures have cooled. Another great reason is the lack of mosquitoes and black flies in the fall. The weather in the fall can present its own challenges. It will most likely be very cool in the morning and warm up throughout the day and then cool off again in the evening. Make sure to dress in layers to ensure you do not get too hot or cold. The water temperatures can get down into the 40F’s and 50F’s in October, so be sure that you have enough non-cotton clothing on to stay warm. Synthetic materials and wool are your best options. Even though the air temperature may get into the 60F’s, your body will be partially submerged in the much colder waters as you wade. 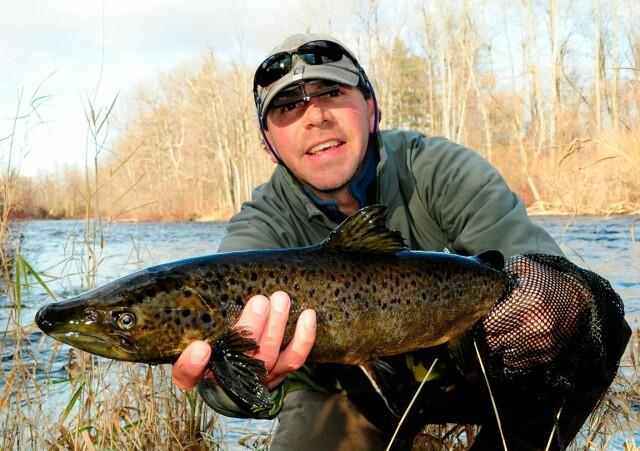 The numerous ponds, lakes, and reservoirs in the Adirondacks offer some more great fishing options in the fall. Northern pike will start feeding aggressively after the first heavy frost. Present them with a large streamer with a wire leader in the shallow areas and weed beds of the lake. Retrieve your fly slowly and get ready for a fight as the pike are known for their strength. Union Falls and Franklin Falls reservoirs are great places to search for pike in the fall. Trout season officially ends on October 15th, but there are special regulation sections on the West Branch of the Ausable River, Saranac River, and a few other bodies of water, that are open until they ice over (and during any thaws throughout the winter) in the Adirondacks. Be sure to check your regulations guide to ensure the body of water you are heading to is still open for angling. For the best experience fly fishing in the Adirondacks, I would recommend hiring a guide to increase your chances of success. A local licensed guide can show you to some great waters that may be a little bit off the beaten path as well as teach you the best techniques for angling in the Adirondacks. 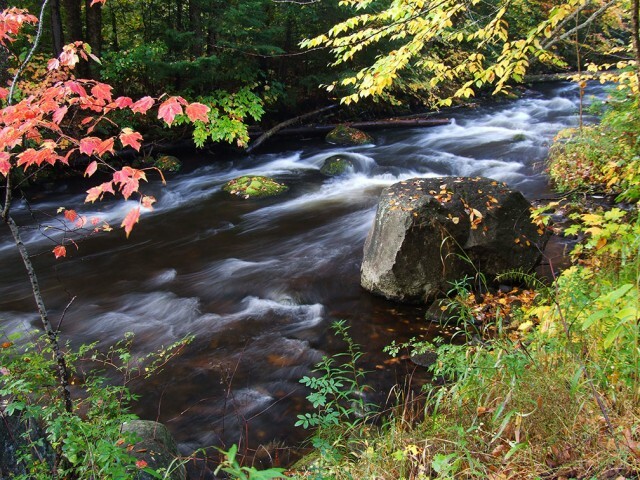 There are multitudes of streams, rivers, ponds, and lakes in the Adirondacks and a guide can steer you towards the waterway that will be productive and put you in front of the fish you would like to catch. Check out the following pages for more information on guides page and seasonal fishing. These great fall conditions won't last long. Check out places to stay in the Whiteface Region and browse our Stay & Save Packages. Book your Whiteface fishing getaway today!